Butterflies are the type of wildlife people most want to see near their homes. 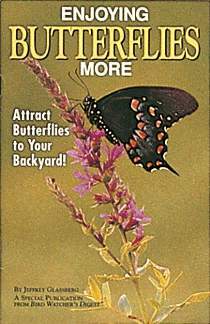 This booklet tells how to attract butterflies to your yard and garden. You'll learn about their behavior, stages of life, and how to identify what species of butterfly you are watching. The booklet also offers tips on photographing butterflies and lists butterfly clubs and organizations you can join. 32 full color pages, 5" x 8" paperback.